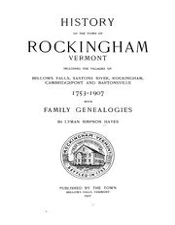 There are two volumes of The History of the town of Rockingham, Vermont, including the villages of Bellows Falls, Saxtons River, Rockingham, Cambridgeport and Bartonsville. * The 1907 History writen by L.S. Hayes is available in the Library. (click here for Library holding information), you can alsoclick here to read it as a Google Book. * The 1957 history, written by Frances and Leverett Lovell is available in the Library. (click here for Library holding information). Both contain family genealogies and Indexes of Persons and are a great place to start your local history or genealogical research. ROCKINGHAM town (New Hampshire grant of 28 December 1752) took its boundaries from Westminster, the next town to the south, which had been granted a few weeks earlier. As with most of the towns in its vicinity, Rockingham’s territory had been part of the old Equivalent Lands, and some of the grantees named in the Wentworth grant had owned some of those lands. But unlike the grantees of most of the other towns created in the 1750s, the Rockingham proprietors did not have to go back to Wentworth for a re-grant; they were able to begin a settlement within the stipulated five years. In fact, they even complied with the provision to hold a proprietors’ meeting in March of the following year. Elected as the moderator of that first meeting was Benjamin Bellows, one of the grantees who had owned some Equivalent Lands territory, and for whom the settlement of Bellows Falls later was named. The town of Rockingham is named for one of Benning Wentworth’s relatives, Charles Watson-Wentworth (1730-82), who had added the Wentworth surname through his mother, Anne, a daughter of Thomas Wentworth, the first Earl of Strafford. Charles had succeeded his father as the second Marquis of Rockingham in 1750. He had been a volunteer under the Duke of Cumberland against the 1745 Jacobite uprising, and upon succeeding to his title he apparently felt obligated to assume an active role in government, although by inclination he was a country gentleman and sportsman. Throughout his career, which spanned thirty crucial years, Rockingham was twice prime minister, and held almost every other post of any consequence. In this country the Marquis of Rockingham is remembered for having secured the repeal of the Stamp Act, and for proposing that England grant independence to the American colonies. The villages of Rockingham and Bellows Falls both got post offices in 1801. At that time Rockingham was considerably more important because it was centrally located and was the site of the town offices. The old meetinghouse there, which served for both church services and town meetings, was built in 1787. As the town’s population grew, more businesses chose to locate at Bellows Falls. It gave easier access to larger markets for finished goods and sources of supplies for manufacturing, and its location on the Connecticut River made for cheap transportation. When the railroad came through town it missed the village of Rockingham, for the village was on a hilltop overlooking the Williams River valley, which the railroad followed in its curve west away from the Connecticut River. In 19o8 the office at Rockingham village closed, and since that time no post office has used the town’s name. That confuses the out-of-stater, who thinks that Bellows Falls is a town when in fact it is a village in Rockingham town, and who is further confused at being unable to find any Rockingham village—unless he stops off on Vermont Route 103 to see the old Rockingham Meetinghouse and cemetery. BACKGROUND NOTE. Bellows Falls village takes its name from Colonel Benjamin Bellows, who was one of the original Rockingham grantees. He also was named in the charter to call the first proprietors’ meeting, and at that meeting he was elected moderator and proprietors’ clerk. Vermont tends to think of Colonel Bellows as one of her own because Bellows Falls is named for him, but he actually lived across the Connecticut River in Walpole, New Hampshire, where there is a monument to him. The Bellows family originally came from Lunenburg, Massachusetts, and many of them and their in-laws were co-grantees, along with Colonel Bellows, in the dozen or more towns where he was granted land. The Colonel had gained his rank in the British army, serving in several of the wars against the French in North America. His last military service was in the colonial cause at the battles of Hubbard-ton and Bennington early in the Revolutionary War. He was a skilled surveyor, and surveyed most of the towns on both sides of the Connecticut River that were later granted by Wentworth. At the time of his death in 1777, Colonel Bellows is said to have held title to about 9,000 acres in Vermont and New Hampshire. The third post office within the town of Rockingham was opened in 1818 at the village of Saxtons River, and it is still in operation, serving the busy little community that is the home of Vermont Academy (founded in 1876). The village has its name from the nearby stream, Saxtons River, which is said to have been so named because, long before the town was established, a surveyor named Saxton fell into the stream. The fact of Saxton falling into the stream may be questioned; but it is certain that a surveyor named Saxton did map the area many years before Wentworth started granting land in the area during the early 175o’s. Indeed, the grant for Westminster, dated 9 November 1752, cites Saxtons River as one of the survey points for that town’s boundaries. The town’s next post office was opened in 1834 at the village of Cambridgeport, which is partly in western Rockingham and partly over the line in Grafton. That office is still in service, and its name sometimes confuses even postal officials. Vermont has a town of Cambridge in Lamoille County which has a post office of Cambridge; therefore it often is assumed that there is some connection between Cambridge and Cambridgeport—and there is none. Cambridgeport in Rockingham gets its name from one J. T. Cambridge, who built a fulling mill at the village about 1825. His factory burned sometime after the post office was established, and it is thought that he left the area soon afterwards, but his name has stayed on in the village’s name. The last post office to be opened within Rockingham was established in 1835 at the village which now is known as Bartonsville, but which was then called La Grange. In many places throughout the United States the name La Grange has been used in association with the Granger Movement, which was founded in 1867. But La Grange in Rockingham had its name long before then, so it probably was named for the country estate of the Marquis de Lafayette. His visit to Vermont in 1825 had been a source of great excitement, particularly for those towns through which he had passed, and Rockingham was one of them. It is not known why the residents of the village (or the postal officials) wanted to drop the name. However, La Grange was changed in September 1837, after only nineteen months, to Bartonsville. That name is said to come from Jerry Barton, one of the early settlers in the area. But the Bartonsville name has not always been spelled in exactly the same way: initially it was spelled with the s, but from 1850 to 1860 the s was dropped and the name was Bartonville; then in 186o it was changed back to Bartonsville for the last time. Located about halfway between the site of the old village of Rockingham and Bartonsville is a hamlet, now usually called Brockway (sometimes Brockways) Mills, which takes its name from the Brockway woolen mills that were located there. In the 188o’s the village was known as Nourses Mills, the name deriving from the Nourse family gristmill, which was the chief business at that time. The village never had a post office. One of the strangest place-names ever to be associated with a Vermont town was Old Dads Turnout, which can be found in the 1855 handbook of operating rules for the Rutland Railroad. Old Dads Turnout was never a habitation place-name; rather, it was a nickname for a siding, about halfway between Bartonsville and Rockingham villages, where one train could pull off the track and allow another to pass by. During this same era, two stations on the line within the town were known respectively as Midway and Riverside. Two of the area designations within Rockingham are Pleasant Valley, only one of many in the state, and Atcherson Hollow, which came from a local family. The town has no really high elevations, and most of the hills are known by the names of local families: Coburn, Colley, Darby, Hogan, Jones and Parker hills. The exceptions are Oak Hill, named for the trees that once grew there, and Signal Hill, from which the early settlers are said to have signaled across the river to their friends in Walpole during Indian emergencies. The Indians knew the Connecticut River well as a main travel route, and they had names for various topographic features within or near the town of Rockingham. The meadows outside Bellows Falls were called by the Abnaki Niben, meaning “summer,” probably indicating this was a summer camping place. When the white man saw the falls in the Connecticut River, between what is now Rockingham in Ver¬mont and Walpole in New Hampshire, he called them Great Falls. The Indians had had very much the same reaction. The Abnaki name for the falls was K’chi Ponteguh, meaning “great falls in the river,” or Kitchee Ponteguh, meaning “great rapids on the river.” The falls at the village of Bellows Falls have always been noted for their sharp and steep drop and the whirlpool at their bottom. The Pennacook Indians described the pool in their own terms as Chee Coke, “the great kettle”—which is very much the way the swirling waters in the rocky basin still look when the river is running full.